There is a lot of crap out there being pushed toward the grilling crowd. Below is a list of the worst offenders — when somebody tries to sell you any of this, run for the hills. 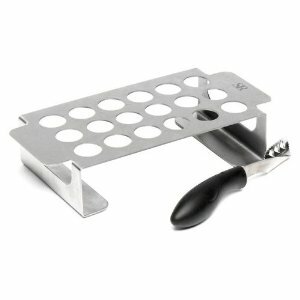 Any tool that takes the shaping of burgers out of your hands, and forces you to grill nine burgers at the same rate. These baskets were big circa 2005, when everybody was freaked out about touching their food (egads!). This is the typical crap you’ll find people using when they just purchased a $3000 gas “grilling” monstrosity, and decided to drop another $30 at the big box retailer. Part of the joy of hamburgers is shaping the meat. The personal touch of how you shape the meat is what makes us individuals. Tools like this are the grilling equivalent of suburban housing developments. Any endorsed single-function goofy product that looks like it was made in China for about a dollar. 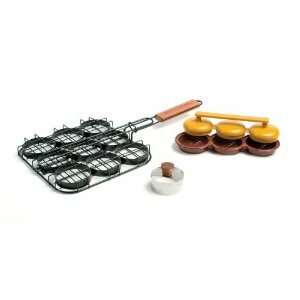 What you see is the “Steven Raichlen Best of Barbecue Stainless Chili Pepper Roasting Rack and Corer Set” which symbolizes to me an entire category of grilling crap you don’t need. Learning how to cook without the use of endless gadgetry is not only good for your soul, but it will make you the envy of the neighborhood. Essential tools are fire, a grill, and high quality tongs/spatulas. That is all. Specially produced and packaged “grilling planks.” You know what these (and I quote from Amazon) “5.5- by 7.75 -inch Organic Cedar Personal Grilling Planks, Pack of 4” actually are? Can you guess it? I’ll give you a minute because this is a toughie. Okay, ready? They are planks of wood, and there are lots of places where you can buy planks of wood. Of course don’t buy wood that is treated with rot-resistant chemicals. Of course don’t use “made for shelving” pine. But good, clean, chemical free cedar boards can be found at almost any quality lumber yard (like buying hamburger, find a place that cuts and processes their own product). I personally use the rough cut cedar from a local lumber yard … 1×6 boards that buy once a year and I can trim to length. Costs about a tenth of what the “Personal grilling planks” do.